With their simplistic charm, these Rimini tables can work as side tables and also work as garden footstools. Offering multiple height settings, these teak garden tables are wonderfully versatile. Sturdy and robust, Rimini tables can hold any items and are sure to provide you with long, fruitful use for years to come. These teak garden tables have been crafted out of the finest grade-A teak, meaning that they can withstand the test of weather and time and are guaranteed longevity. Able to fold flat, these Rimini tables can be easily put into storage if needed and will take up minimal space. 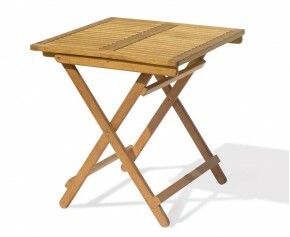 Our teak garden tables boast a simple design that is sure to compliment any other existing furniture. View our range of Rimini tables here.